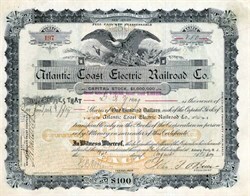 Beautiful uncancelled certificate from the Atlantic Coast Electric Railroad issued in 1897. This historic document has an ornate border around it with a vignette of an eagle. This item has the signatures of the Company’s President, John P. O'Brien and Secretary, George B. M. Harvey and is over 113 years old. Issued to and signed on the verso by George W. Young. Asbury Park & Sea Girt Railroad Co. Seashore Electric Railway Co.
Atlantic Coast Electric Light Co. West End & Long Branch Railway Co. Transfer Agent and Registrar, Knickerbocker Trust Co., New York. In 1895, the Sea Shore bought the West End and Long Branch Street Railroad horse-car line and renamed it the Atlantic Coast Electric Railroad. The double-tracked electric line was extended to the Shrewsbury River, where passengers could catch steamboats for New York. Atlantic Coast Electric Railway Co.—This company is a reorganization of the Atlantic Coasl Electric Railroad Co., chartered Apr. II, 1895, for 999 years, and which was sold the new company on Dec. 4, 1905. Annual meeting in Apr. This company leases the property of the Seashore Electric Ry. Co.. of Asbury Park, and owns the entire capital stock of the West End & Long Branch Ry. Co.. the Asbury Park & Sea Girt R. R. Co., and the Atlantic Coast Electric Light Co., and $150,000 of the stock of the Seashore Electric Ry. Co. The company's lines connect Long Branch, Elberon, Deal, Allenhurst, Asbury Park, Bradley Beach, Kerstein City, Neplune City, Avon. Belmar, Spring Lake and Sea Girt. Incorporated 1905, acquiring Atlantic Coast Electric Railroad Co. (incorporated 1895), leasing following companies. Asbury Park & Sea Girt Railroad - incorporated 1898, acquiring Asbury Park & Belmar Street Railway Co. (incorporated 1894). Seacoast Traction Co. - incorporated 1904. Seashore Electric Railway - opened 1888, leased 1896 to Atlantic Coast Electric Railroad Co.
Atlantic Coast Electric Railway was acquired in 1927 by Coast Cities Railway Co., which ceased operations in 1931. Successor bus companies included Coast Cities Coaches Inc. (1931-1979), and Monmouth Bus Lines Inc. (1979-1992). Service was subsidized beginning in 1969. Since 1992, bus service has been operated under contract for New Jersey Transit by Connex/TCT Transit.